There are a lot of options available to tourists wanting to get around Paris. Two of the most popular, aside from walking, is taking the bus or the metro. Every time we visit Paris, the big K and I prefer to take the metro because it's faster and more convenient. Don't be confused! There are two kinds of trains in Paris, the RER and the Metropolitain or metro for short. The RER (Réseau Express Régional) are suburban trains that take you to/from Paris and its outskirts. While the metros are the Paris subway (some are overhead) trains that go around the city. If you will be arriving at CDG airport (Paris Charles De Gaulle), one option to get into Paris is by the RER ligne B. It is about a 45 minute train ride. One-way fare as of Oct2012 is EUR9,50. Most passengers get off at Gare du Nord to transfer to any of the several Metro lines serving Paris. The EUR9,50 fare is good until your final destination in Paris. No need to buy another ticket for the Metro (as long as you don’t exit the station). Two of the things we look forward to every time we go to Hong Kong is the food and the shopping. Not necessarily in that order. This time was no different. Once again we had our fill of traditional Hong Kong chow. We also discovered a new store that sells quirky, novelty items. Flaky, gooey egg tarts and pork pies, still steaming from the oven, from our favorite bakeshop in TST. The big K and I just came from Hong Kong on our yearly anniversary treat, which by the way is still a month away. Too early to celebrate, you say. Well, if you're in a profession that does not afford you a regular working schedule you learn to make plans quickly on your free days. This month the big K had four straight days free! Bags packed, we were off on another adventure! Either that or wait for next month's work schedule. Plus there was that matter of the "end of the world". We love going to Hong Kong in December. The Christmas lights and decorations are all up. Weather is just right, comfortably cool to walk around. The Observation Tower at Petrin Hill is Prague's equivalent to the Eiffel Tower except that it is a whole lot shorter at 63 meters as compared to the Eiffel's height of 320. But then again the Petrin Tower is located on a 318 meter high hill giving it a good view of the city. The Petrin Tower was built in 1891 for the Jubilee Exhibition much like the Eiffel Tower during the 1889 World's Fair. Arriving at the Jewish Quarter, the big K and I were wondering why there weren't too many people around. Seemed like we left everyone at the Prague Castle. Or the place was just not popular with visitors. Anyway, it was quite a relief really after having to deal with the crowd at Prague Castle. Heading straight to the Old Jewish Cemetery, we saw that the gates were closed. Uh-oh, now what? "Closed for the Holiday" a sign said. Really? It was a holiday? We later found out it was Yom Kippur (Day of Atonement), the holiest day of the year for the Jewish people. Just goes to show how little we know of the Jewish religion. So, the big K and I ended up just walking around, admiring the beautiful buildings and browsing the shops that were open (obviously they weren't Jewish). I love the sunflower door on this apartment building. And it comes with a clock too! While in Bangkok with the big K in one of his company trips, I saw this restaurant featured in one of the travel shows on TV. It had a miniature railroad running around the restaurant. It was a complete railway network with tunnels, draw bridges, ponds, rock formations, houses and trees. Nothing out of the ordinary you'd say, right? But, wait until you see the trains! What makes this place one of a kind are the miniature trains that chug along the tracks, carts loaded up with drinks and serving them straight to your table. Now how cool is that? And, where is this unique restaurant? In Prague, of course! 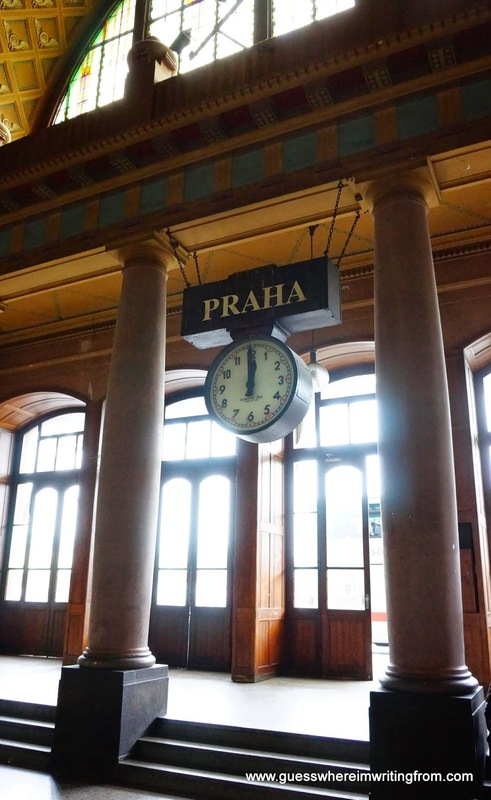 Did you know that it was only in 1992 that UNESCO inscribed the historic center of Prague as a World Heritage Site? The five areas that comprise the historic center are Old Town (Staré Město), Lesser Town (Malá Strana), New Town (Nové Město), the Jewish Quarter (Josefov) and the Castle district (Hradčany). Thanks to the fall of communism in the former Czechoslovakia we can enjoy the beautiful city of Prague today. Emerging from the ﻿underground metro, the big K and I were greeted by this beautiful scene. A big square filled with tall, graceful, old buildings and classic trams running on cobbled streets. Old World Prague at its best! Náměstí Republiky is just steps away from Old Town Square. Our last day in Amsterdam, the big K and I decided to splurge a little bit for dinner. Read: find a local restaurant that will serve good food, cold beer and not cost an arm and a leg. But where? In the meantime, we went to the nearby cheese shop to look for some good ole cheese (we did get to buy a four year old Gouda) that we could snack on on the night train to Prague. They say pigs can fly, apparently so do cows. Found a four-year old Eden cheese in our fridge but it wasn't as good as this four-year old Gouda. The cheese shop also doubled as a cheese museum. As luck would have it, we overheard the cheese guy recommend to another customer apparently in the same boat as us, a local restaurant that served good food. Trying out my best impersonation of a spy, I took notes of the restaurant's location. "Go around the back, make a left at the flower shop then hang a slight left, right by the dead tree which isn't there anymore, pass the parked van whose color is tan, look for Dan who'll be talking to Fran holding the golden AN...." Huh? Actually, it was just down the street from the shop. The De Reiger (The Heron) we later found out is one of the oldest pubs in the Jordaan district. It still had its original interiors from the late 1800s, high-beamed ceilings, old lamps and paintings in the Art Deco style. The pub was later transformed into what it is today a cafe-restaurant primarily serving Burgundian cuisine. Hmmm..... No Dutch food? Nevertheless, the food and beer were good! The sign is upside down and it is for beer. The two may be connected. Our bellies content and our hearts filled with wonderful memories of our visit, we bid Amsterdam Tot ziens! Until we meet again! The big K and I love going to local markets, mainly because of the local food! There is something intrinsically special with local markets. The explosion of colors, the different sounds, the aromas that will assault your senses once you arrive is something else! As my blog moves along you will be reading a lot of posts about the different local markets the big K and I have visited in our travels. On this leg of the trip, we visited two well-known markets in Amsterdam, the Bloemenmarkt or the Flower Market and the Albert Cuyp street market. The Bloemenmarkt is the world's biggest floating flower market (assuming, of course, that you believe everything you read on the internet). But whatever. It is big. It is located on the Singel canal, they have just about everything plant related and a few that aren't. Flower stalls on floating barges. 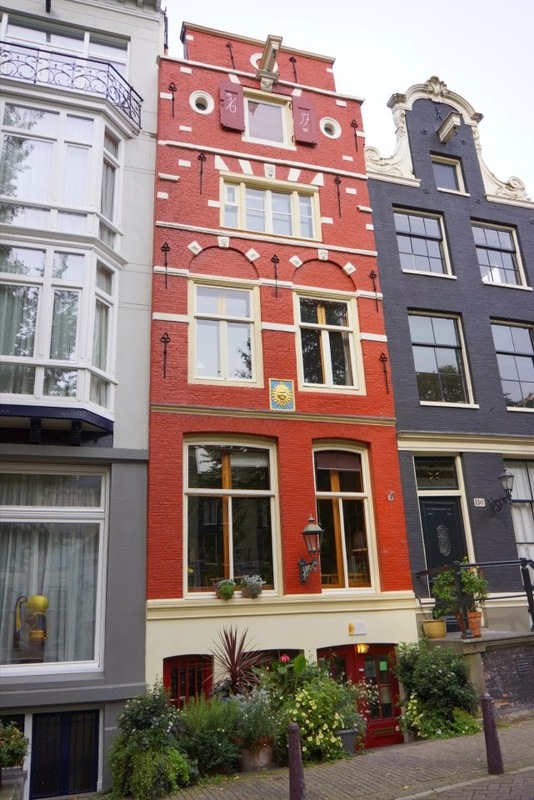 First time you walk around the canals in Amsterdam, it is surprising and more than a bit alarming to look down a street and see the houses, all in various stages of lean, some rather more severe than others, like a long line of drunks caught in mid-stagger. Lunch was proving to be quite a challenge. It wasn't as much a question of where to eat but what to eat! Everything looked good! Breads, cheeses, herring, sweets and the list goes on.... We didn't know where to start! A bit pricey but oh so good! After a hearty breakfast and another oh-dear-we-forgot-about-the-time chat with Carlos, the big K and I were finally off on another fun-filled day. Our first stop, Rembrandtplein or Rembrandt Square. We were pleasantly surprised to find an art market set up at the square. The big K and I thoroughly enjoyed the different displays of sculptures, paintings and drawings done by local artists. It was so tempting to take home an item or two as souvenirs of our visit but the big K didn't fancy lugging a painting on a three week trip. There's Mr. Rembrandt making sure all goes well. One of the things the big K and I share is the love of history. Far from being history experts we do appreciate the stories that go behind it. So the first thing we do when we hit a new place is to visit the local museum(s) as it offers us the opportunity to get to know the history of the place. I have always wanted to start my own travel and food blog but for the life of me I couldn't think of a catchy title for it. Then in one of the souvenir shops in Paris I saw this postcard. And what better way to start my blog than with a post from the City of Light or City of Love, whichever you prefer. To me it will always be Paris!